A few days ago, in my post on the ducks of San Diego, I noted that mergansers were my favorite ducks, in part because of their tooth-like bill serrations, and that I knew of no other birds (except sort of in geese) that had such modifications of the bill. Well, of course, as soon as I said it in public, I’m proved wrong*. Look at these frighteningly fierce serrations on a hummingbird! As explained by James Gorman of the New York Times, explicating a recent paper by Alejandro Rico-Guevara and colleagues, this “toothsome” smile arises from the struggle for controlling nectar resources. The short version: hummingbirds’ bills are long for getting nectar out of flowers, and they are hooked and serrated to keep other hummingbirds away from the flowers. *Being shown to be mistaken, promptly after announcing my generalization, is an example of what Ernest E. Williams called the Principle of Unsympathetic Magic. He recounted his recognition of the Principle in a very short paper in 1977. 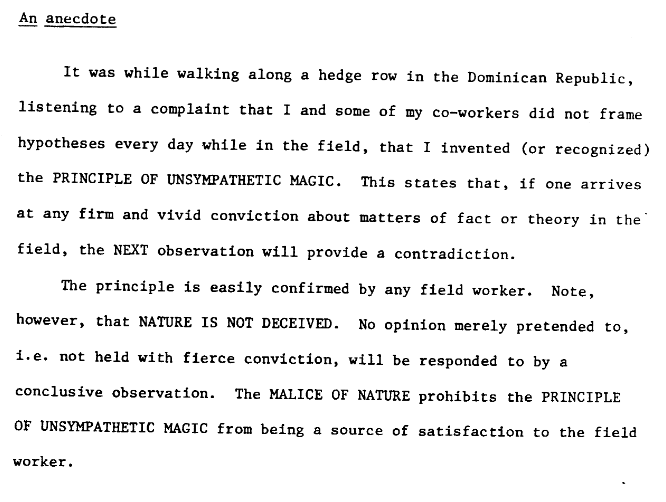 Ernest E. Williams’ explication of the Principle of Unsympathetic Magic, Anolis Newsletter III, 1977, p. iv. This entry was written by whyevolutionistrue and posted on February 12, 2019 at 7:45 am and filed under birds with tags Ernest E. Williams, hummingbirds, teeth. Bookmark the permalink. Follow any comments here with the RSS feed for this post. Both comments and trackbacks are currently closed. And hey – the more knowledge the better. How wonderful the quote from my academic advisor and research supervisor EE Williams! Thank you for honoring him with this inclusion as I had not remembered him writing this in 1977. However, knowing him very well from 1968 to when he passed away, he would often include in his lectures stories of paradigms that would be rejected when better models came along. He was man enough to recognize when he was wrong unlike many of the other well-known egos I interacted with at Harvard. I was thinking that surely the weaponry in the beak would be mainly useful for other activities. Hummingbirds are enthusiastic insectivores, and the teeth would help to secure their prey. They also build nests that are woven with spider webs, and the teeth strike me as useful for managing that as well. But the video mentions that the teeth are a male thing, and so I am not sure that my view is that simple. There is some developmental biology literature on actual tooth development and the preservation of appropriate genes in birds. Ed Kollar showed the ability of mammalian mesenchyme to induce genes for enamel synthesis in chick epithelium (the hen’s tooth experiment) Science 207, 993-5 (1980). Dr. Kollar was the grad school advisor (at UofC in the 1970s) of my postdoc advisor – I’m not sure if that makes him a scientific grandparent or some form of a great uncle. He had a long career working on tooth development. 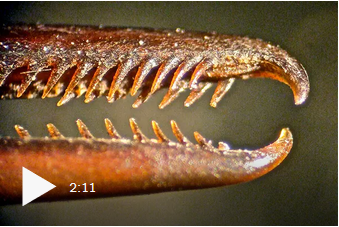 Harris et al from Manchester described “The Development of Archosaurian First-Generation Teeth in a Chicken Mutant” Current Biology 16, 371-377 (2006) where an emryonic-lethal talpid2 mutant chicken was shown to develop crocodile-like teeth. Not really an area I know anything about, but it’s interesting, although perhaps irrelevant to the structures that you are describing. Birds are truly poorly disguised dinosaurs! Evolution might not need to develop new approaches to allow them to make teeth, if it could just switch back on the capabilities that they already carry. Entirely possible, as I noted I don’t really know much about teeth (or about birds for that matter). There are all sorts of possible scenarios, many mammals are born without teeth so one could imagine a bird in which tooth development switches on post-hatching, perhaps around the time that they are developing their adult feathers, to allow them for use in independent feeding. Given that birds developed from toothed dinosaurs and have lost their teeth it’s certainly reasonable to presume that there is no strong selective pressure to keep them, and as you suggest, there may be pressure to lose them. But it’s interesting to see that similar structures have evolved. The link to the review paper in the NY Times leads you to an Open Access paper that is a good example of patient, detailed analyses and the section on feeding mechanisms is a great study of Biomechanics. Also, thanks for posting the E. E. Williams quote. I’d missed that one. I have one that I always tell my students: “When studying behavior in the field, the animals will not demonstrate the behavior during your formal observation periods. Only later, will you see it when you’re not prepared to collect data”. It seems to be particularly true for squirrels. There is so much diversity in biology, that it is often hard to say “you will not find X in this or that taxa” without risking to be offered an exception to the rule. I thought I’d posted this, but find no record, so post again. Here are more birds with teeth https://www.momtastic.com/webecoist/2010/09/28/brush-your-beak-10-amazing-birds-with-teeth/, though I don’t know if the spiny things inside penguins’ mougths and on their tongues count — did they migrate there? How serendipitous. Just last month I was investigating creationist Kent Hovind’s misunderstanding (that these hummingbird teeth atavistically refuted bird evolution!) that hinged in part on his not realizing that the “teeth” weren’t actually teeth. To learn that a technical paper had appeared relevant to exactly this issue, and their use as fighting tools, is a delight. In it goes to my TIP data field of course. How wonderful the quote from my academic advisor and research supervisor EE Williams! Thank you for honoring him with this inclusion as I had not remembered him writing this in 1977. However, knowing him very well from 1968 to when he passed away, he would often include in his lectures stories of paradigms that would be rejected when better models came along.